Today : The majestic Fort stands like a sentinel, surveying the passage of time - 350 years have come and gone and many a stone records facts of its past, especially for the traveller who enjoys a sense of history and seeks a story from the silent walls. or a hunderd years, it became a town of unparralled grace a Roopangar which literally means a 'city of beauty'. Roopangarh Fort became the hub of activity. Within its nine turreted fortification were made foundries, armouries,granaries, secret passages, jails and step-wells. 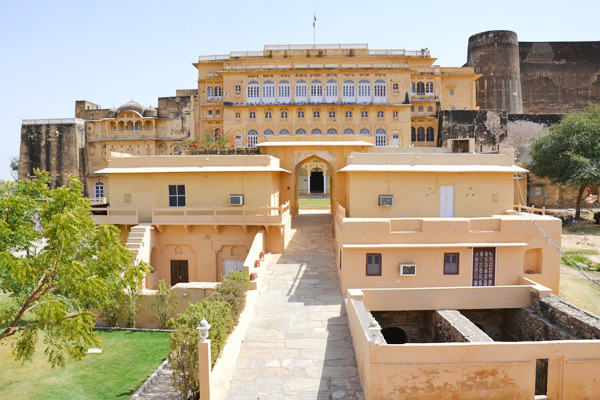 Adjacent to the 'charbhuja' (4 towered fortification) nestled the palaces, delicated and fragile. The beauty of living was transcribed to a refind architecture in the form of large audience halls, incredibly high ceilings, wide doors and incredibly high ceilings, wide doors and casements as if the inhabitants drank nothing but the exhilarating breeze.